Blindspotting is a 2018 American comedy-drama film written, produced by and starring Daveed Diggs and Rafael Casal. Carlos López Estrada directs while Janina Gavankar, Jasmine Cephas Jones, Ethan Embry, Tisha Campbell-Martin, Utkarsh Ambudkar, and Wayne Knight also star. The plot follows a parolee with three days left on his sentence, only to have him witness a police shooting that threatens to ruin a lifelong friendship. Casal and Diggs, childhood friends in real-life, wrote the screenplay in the mid-2000s, initially to speak for the city of Oakland which they felt was often misrepresented in film. After years of delays, the pair's schedules finally allowed them to make the film, with principal photography beginning in June 2017. Blindspotting had its world premiere on January 18, 2018 in the U.S. Dramatic Competition section at the 2018 Sundance Film Festival and was released in the United States on July 20, 2018, by Lionsgate. The film received positive reviews from critics, and at the 34th Independent Spirit Awards, was nominated for Best Male Lead for Diggs' performance, while López Estrada earned a Directors Guild of America Award nomination for Outstanding Directing – First-Time Feature Film. Collin Hoskins (Daveed Diggs), a convicted felon, is struggling to finish the last three days of his probation. Collin, along with his short-tempered best friend Miles Turner (Rafael Casal), works for a moving company located in Oakland, a city in the Bay Area. One night while waiting for a red light, Collin witnesses a white police officer (Ethan Embry) gun down a black civilian. As Collin is haunted by the incident, he begins to have nightmares and experiences hallucinations. At the same time, Miles becomes distraught by the gentrification of Oakland, and a resulting sense of loss of identity, home, and belonging. Miles purchases a gun from a friend on the basis of self-protection, an action which Collin strongly disapproves. As Miles continues to display erratic behavior, Collin's ex-girlfriend Val (Janina Gavankar) warns Collin of the dangers that may come from a continued friendship with Miles. Later that evening while having dinner, Miles' gun accidentally ends up in the hands of his young son Sean, an incident which horrifies Sean's mother Ashley (Jasmine Cephas Jones), forcing both Collin and Miles to leave the house. At a party, an agitated Miles assaults a black man who misinterpreted Miles' persona as cultural appropriation, leading to a fight between the two. Miles uses his gun to terrorize the party guests before being stopped by Collin. In an explosive argument, Collin criticizes Miles for his reckless behavior and the trouble it keeps causing him. With his probation now over, Collin continues to feel mentally troubled by the murder he saw. As they are finishing a moving job, the house is revealed to be that of Officer Molina, the same officer whom Collin witnessed gunning down a black man a few days earlier. Collin confronts the officer at gun point and criticizes the relationship between the police and black America, but refuses to shoot him, leaving the distraught officer behind. Following a moment of solemnness, Collin and Miles repair their friendship as they drive off to their next job. Daveed Diggs as Collin Hoskins, a former convicted felon on his last three days of probation. He appears friendly, laid back and is likable. Rafael Casal as Miles, Collin's short-tempered and reckless best friend. The two have been close since childhood. Janina Gavankar as Val, a desk secretary and Collin's love interest. According to Miles, she never visited him while in prison. She recommends to Collin he end his relationship with Miles because he could get him in trouble. Jasmine Cephas Jones as Ashley, Miles' wife and mother of Sean. 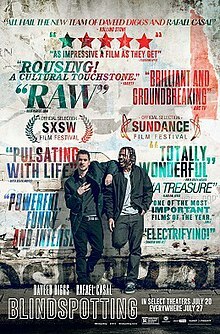 The screenplay for Blindspotting was written by Rafael Casal and Daveed Diggs over a period of nine years. Daveed, who grew up in Oakland, and Rafael, who grew up in bordering Berkeley, California, felt that cinematic portrayals of the San Francisco Bay Area have constantly "missed something". They wanted to draw attention to the culture, community, and sense of "heightened reality" that shape life in Oakland. The film addresses issues of gentrification, police violence, and racism. Diggs and Casal said about 90% of the film is a result of the first draft, with various rewrites done as filming took place to update it to reflect modern times. Due to Diggs being constantly busy performing in Hamilton, the pair had to delay the film for an extended period of time. Principal photography finally began in June 2017 and lasted for 22 days, filming around Oakland. Blindspotting premiered at Sundance Film Festival on January 18, 2018, and was limited released in the United States on July 20, 2018, with a nation-wide release date of July 27, 2018. Blindspotting grossed $332,500 in its opening weekend from 14 locations, including in Los Angeles, New York City, San Francisco, and Oakland, for a $23,750 average per theater. It expanded to 513 theaters in its second weekend and made $1.3 million. On review aggregation Rotten Tomatoes, the film has an approval rating of 93% based on 151 reviews, and an average rating of 8/10. The website's critical consensus reads, "As timely as it is overall impactful, Blindspotting blends buddy comedy with seething social commentary, and rises on the strength of Daveed Diggs' powerful performance." On Metacritic, the film has a weighted average score of 77 out of 100, based on 42 critics, indicating "generally favorable reviews". ^ "Blindspotting Budget, Box office, Cast, Reviews, Release date, Scenes, Story". BestMovieCast. January 2, 2019. Retrieved January 27, 2018. ^ "Blindspotting (2018)". Box Office Mojo. IMDb. Retrieved October 27, 2018. ^ Debruge, Peter (January 3, 2018). "10 Directors to Watch: Carlos López Estrada Opens Eyes With Sundance-Bound 'Blindspotting'". Variety. Penske Business Media. Retrieved January 19, 2018. ^ Debruge, Peter (November 29, 2017). "Sundance Film Festival Unveils Full 2018 Features Lineup". Variety. Retrieved January 1, 2018. ^ Erbland, Kate (November 16, 2018). "2019 Independent Spirit Awards Nominees, 'Eighth Grade' & 'We the Animals' Lead". IndieWire. Retrieved November 16, 2018. ^ Los Angeles Times (January 19, 2018). "Sundance 2018: Blindspotting cast talk about their love of Oakland". YouTube. Retrieved May 2, 2018. ^ Brooks, Brian (July 19, 2018). "Daveed Diggs, Rafael Casal Go 'Blindspotting'; Bleecker Street Opens 'McQueen' – Specialty B.O. Preview". Deadline Hollywood. Penske Business Media. Retrieved July 19, 2018. ^ D'Alessandro, Anthony (April 19, 2018). "Lionsgate's Sundance Pickup 'Blindspotting' Moves Up Into July – Watch The Trailer". Deadline Hollywood. Penske Business Media. Retrieved April 21, 2018. ^ D'Alessandro, Anthony (July 22, 2018). "Shocker: 'Mamma Mia 2' Meets B.O. Waterloo As 'Equalizer 2' Is The No. 1 Winner That Takes It All With $35M+". Deadline Hollywood. Penske Business Media. Retrieved July 22, 2018. ^ "Blindspotting (2018)". Rotten Tomatoes. Fandango Media. Retrieved January 27, 2019. ^ "Blindspotting Reviews". Metacritic. CBS Interactive. Retrieved January 27, 2019.